Things escalate quickly when Amanda receives a series of unmarked packages at her front door. After discovering a mysterious gift on the front porch, she hires a videographer to document the “adventure of a lifetime”. A visiting stranger with some unexpected news sends Amanda’s world spiraling into chaos, and every embarrassing detail is caught on tape. 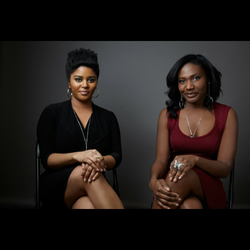 Ashley Denise and Ricki Lynée write, produce and direct short and long-form content for their boutique film production company, Nuanse Entertainment. Their mission is to create colorful characters for every genre and to contribute to the perpetuation of new narratives about the black experience. Visit NuanseEntertainment.com. Ashley Denise discovered her dream of writing for film and television while studying English at Yale University. In 2009, she moved to New York to pursue her career. She established Nuanse Entertainment, a boutique production company, whose projects include feature-length and short films, webseries, comedy sketches and music videos that have screened at festivals and showcases across the country. Her work has been featured on The Huffington Post, Comcast/Xfinity, IndieWire/Shadow And Act, Project Catalyst, KweliTV and the National Black Public Media Consortium. Ashley is a recipient of Big Vision, Empty Wallet's Kickstart Diversity Program and a member of the Brooklyn Filmmakers Collective. Ricki Lynée is a New York City based actress, model, writer and producer. Born into a large family in Queens, Ricki began acting at the age of 12. She played classical piano for many years and is a former hip-hop dancer. Ricki co-owns and operates the boutique independent film production company, Nuanse Entertainment, alongside Founder/Artistic Director, Ashley Denise. She is also a proud member of Stable Cable Lab Co., a non-profit organization committed to creating an environment for new work and for theatre artists to flourish. Ricki is committed to developing a body of quality work highlighting women and minorities, telling untold stories, and dedicated to challenging social norms. Ricki Lynée recently received the "Outstanding Lead Performance in a Play" award for her work in The Diplomats in the 2017 Fresh Fruit Festival.